For two nights this June, when the sun goes down and darkness drapes Alys Beach, a fusion of digital art and stunning architecture will take over and dazzle spectators with a wondrous display unlike any other. Digital Graffiti, touted as the world’s first projection art festival, features a mesmerizing combination of technology and architecture to project dynamic art forms. 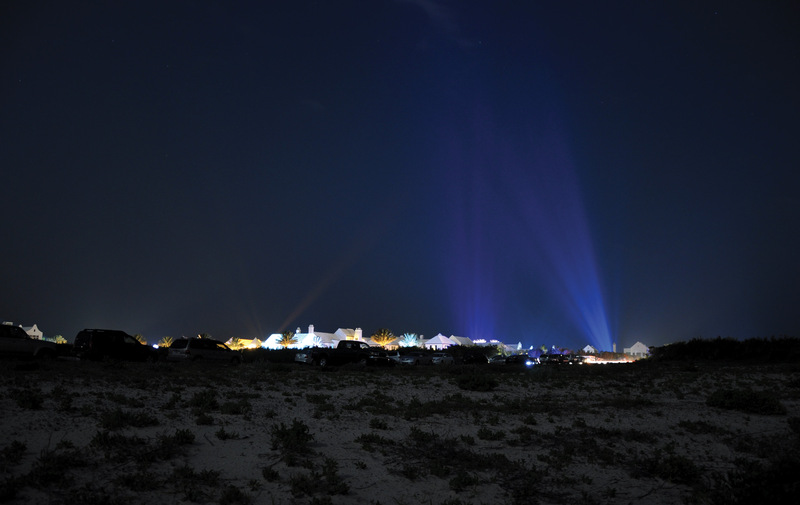 Artists combine digital design, animation, and projection technologies to transmit animated images onto the iconic white walls of Alys Beach. The festival has gained international attention, having been featured on CNN, in USA Today and Britain’s Eastern Daily Press, and even displayed in Times Square in New York City. Florida Travel + Life lists Digital Graffiti in its January/February 2012 issue as one of the must-not-miss “Amazing Weekends” for 2012. One featured artist is reaching out to the public, planning to create a kaleidoscope-inspired marvel. World-renowned new-media artist, animator, and software designer Andy McKeown has a passion for creating large-scale kaleidoscopic projected light works from everyday objects and images. His exhibit theme this year is “KaleidoscopiaLIVE.” The projection will feature up to four hundred gently moving kaleidoscopic images selected from an open public submission via a free toolkit download. “It’s so easy to become part of the festival,” says McKeown. “The free kaleidoscopia toolkit transforms everyone into an artist.” The toolkit can be downloaded from his website, kaleidoscopialive.com. McKeown will project a different selection of images each evening during the festival. Previously a one-night event, the Digital Graffiti festival expands this year to include an additional evening featuring a “Gallery Stroll” on Friday night, during which artists will be available to discuss their work with attendees in a salon-style setting. “Guests can enjoy the same Digital Graffiti art experience as Saturday night, but in a more serene setting,” Siler says. “Guests will stroll and view the art while artists will be on hand to discuss their installations.” Caliza Restaurant will also be open Friday night with limited dinner seating and a cash bar. On Saturday, end the night with a poolside party at the architecturally acclaimed Caliza Pool. Various art workshops, hosted by Alys Beach in conjunction with the Cultural Arts Alliance, will also be conducted during the festival weekend. Artists will compete for a total of $10,000 in cash prizes for digital submissions in the following categories: Best of Show – $5,000; Most Innovative/Experimental Submission – $2,000; Best Florida Submission – $1,000; Best Animated Submission – $1,000; and Curator’s Choice – $1,000. Siler recommends buying tickets online in advance at digitalgraffiti.com, as both Friday and Saturday nights’ events are expected to sell out. Adult tickets are $30 for Friday night and $50 for Saturday. Children’s tickets (12 years and younger) are $10 for each night. Digital Graffiti will be held Friday and Saturday, June 8 and 9, 2012, from 8:30 p.m. to midnight. For more information, contact Kelli Siler at events@alysbeach.com, call toll-free at (866) 481-8390, or visit digitalgraffiti.com. Live like a star, if only for one night, as the local paparazzi take your picture on the red carpet during Alys Beach and VIE’s “me + vie = dg: Meet Me at the Red Carpet” event. The fun begins at Fonville Press until the gates open for the Digital Graffiti festival (from 6 until 8:30 p.m.). “Our goal was to find a partner to take this event to the next level, and we couldn’t have asked for a more fitting partner than VIE,” says Kelli Siler, senior event manager for Alys Beach. “They are stepping up to the plate with complimentary signature drinks and other surprises while Digital Graffiti guests wait for night to fall and the gates to open.” Wine, beer, champagne, and tapas will also be available for purchase. This pre-party, sponsored by VIE, will set the mood for the fun night ahead as guests arrive to a red carpet, where photos will be taken, and then proceed to enjoy cocktails, mix, and mingle to the tunes of a local DJ. Photos will be published in VIE and online at VIEzine.com. The party is free for Digital Graffiti attendees, so pick up your tickets at will call and head over to Fonville Press for the me + vie = dg premiere!